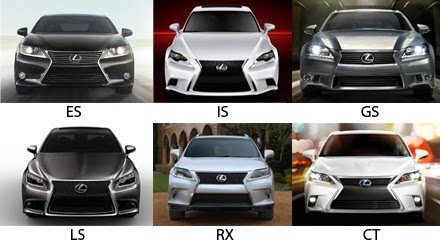 Have you noticed new Lexus cars and trucks with the "spindle" grill lately? Nearly 2 years ago, Lexus designers and executives made a bold design decision to establish a unified look for all Lexus vehicles. Since it takes a while for new cars to go from design to showrooms, only recently have the new "spindle" grill design become more commonplace in the streets. While the initial news led to heavy debate among auto enthusiasts, it'll take some time before we'll know if the bet pays off. This is not a new phenomenon in the auto industry. BMW's "kidney" grill is a well-established trade dress. If you only saw the front of a BMW sans logo, there is no mistaking the Ultimate Driving Machine! In the legal world, this is also known as "trade dress," which is protected much like a copyright or trademark. And it can definitely be a competitive advantage and a key element of a brand's visual identity. Front grill trade dress can be so important, that a company might even sue over it. Like when DaimlerChrysler (before it became Fiat Chrysler) sued GM back in the early 2000's. GM had recently acquired Hummer and was planning to launch the H2, a smaller version of the military-grade Hummer targeted and priced for the consumer market. It's the same market that DaimlerChrysler's Jeep had enjoyed success in for years. DaimlerChrysler alleged the H2's 7-slot grill infringed on Jeep's 7-slot grill trade dress, confusing consumers. DaimlerChrysler claimed that market research showed that two-thirds of Jeep owners confused the H2 for a Jeep model. As for Lexus, I actually like this move and don't think it's a bad design either. Time will tell if this will be a long lasting brand strategy for Toyota. Do you like the Spindle grill?